The emergence of the "spy thriller" in the twentieth century reflects the modern era's technological advancements, and the institutionalization of intelligence services that works to monitor these advancements and their attendant risks on the global stage. Political conflicts between nations are the staple feature of the literature of espionage or intelligence, which also usually figures a heroic spy at the center of the international crisis. While spy novels for most of the twentieth century were dominantly a British invention, American novelists in the last decades have contended for the audience of this hugely popular genre. 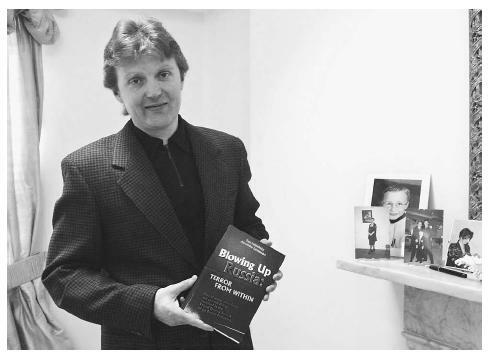 Alexander Litvinenko, former KGB spy and author of the book Blowing Up Russia: Terror from Within, photographed at his home in London in 2002. While serving in Russia's main security agency, Litvinenko's job was to try to infiltrate and topple terrorist networks. British culture a range of foreign interests, languages, and customs. British power faltered as the nation expanded into colonies, inciting fears about the loss of British identity in the face of rapid foreign expansion. Many late-Victorian novels pit blameless Englishmen and women against evil foreigners in a black-and-white interpretation of the threats to "home" from abroad. The heightened sense of xenophobia was one precursor to the spy genre that rested upon the security of national borders. Early British novels that feature the threat of imperial invasion and/or power include Bram Stoker's Dracula (1898) and Rudyard Kipling's Kim (1901). While not formally a spy novel, Dracula contains a detailed international plot whereby the title character, a vampire, is finally ensnared by a band of heroic Englishmen. Kipling's novel takes place in India, with an Anglo-Indian boy using his ambiguous racial identity as a cover for colonial espionage, or the "Great Game" between European and Asian factions. Alongside a growing awareness of an increasingly pluralistic world was a rise of technology that made national security and police work a modern science. Fascination with detective work and forensics at the end of the nineteenth century is exemplified by popular interest in the Jack-the-Ripper murders in London (the 1880s and 90s), and Arthur Conan-Doyle's series of detective novels featuring Sherlock Holmes. Both murder case and detective series detailed the new technologies of modern police work, including fingerprinting, handwriting analysis, and instruments of surveillance such as the camera and the telescope. Joseph Conrad's critically acclaimed novels include several tales of espionage. The Secret Agent (1907) and Under Western Eyes (1911) critique the autocratic and revolutionary regimes in a stunning anticipation of World War I and the Bolshevik Revolution of 1917. The psychological complexity of Conrad's novels set them apart from the new wave "spy thrillers" written during this period, which predominantly depend on action and suspense rather than interior character development. The spy novel in the early twentieth century was inspired most specifically by the advent of organized intelligence agencies in the period prior to World War I. The expansion of the London publishing industry in the late 1800s and early 1900s also contributed to the growing market for "pot boilers"—novels including spy thrillers with popular appeal but little critical value. These books are formulaic, usually with simplistically drawn good and evil characters, but appealed for their seemingly topical reflection of current politics. Erskine Childers's The Riddle of the Sands (1903), for instance, concerns two Englishmen uncovering a German plot to launch a naval attack on Great Britain. The novel was so convincing in its analysis of naval security that the British Naval Intelligence Division was moved to investigate Childers himself for possible underground associations. Among the many anti-German spy novels in English during this period are best-selling author William LeQueux's Spies of Kaiser (1909), which includes exhaustive descriptions of technological gadgetry of the new age of espionage, and E. Phillips Oppenheim's The Kingdom of the Blind (1916). Oppenheim's novel built upon the anti-German sentiment following the German sinking of the British ship The Lusitania in 1915, and includes a plot to sink a passenger ship. Also enormously popular was John Buchan's The Thirty-Nine Steps (1915), which details the urgent necessity for counterespionage in a typical German plot against the English navy. Following World War I and the cynicism it fostered, the next phase of espionage literature reflects a perspective increasingly critical of official state authority. The spies in works by authors including Eric Ambler, Somerset Maugham, and especially, Graham Greene, often are lonely individuals on the outskirts of a power-hungry or opportunistic state government. Maugham and Greene built their reputations in part upon their own experience in espionage. During the Russian Revolution of 1917, Maugham went under cover as a reporter in order to communicate information to British Intelligence. While his novels and stories do not exclusively focus on espionage, he is credited with writing the first modern spy story with literary merit. This work is Ashenden; or the British Agent (1928), inspired by his own experience in Russia, and more famously known through Alfred Hitchcock's film interpretation, The Secret Agent. Greene worked with the British Secret Intelligence Service in Sierra Leone (1941), a job he found perfunctory. His critique of the Intelligence Service emerges in left-wing novels, from The Quiet American (1952) and A Burnt-out Case (1961), to The Human Factor (1978). Writing spy fiction at the same time as Greene, but in a very different style was Ian Fleming, the creator of Britain's most famous fictional spy, James Bond. Fleming, like Greene, had also worked as a spy, but his far-fetched and spectacular plots (which depend heavily on fantastic gadgetry and amazing escapes) appeal to an audience more interested in sensation than realism. Some of Fleming's most famous tales (many of which have been made into movies) include Dr. No (1958) and Goldfinger (1959), which figure Chinese and Russian threats to Western capitalism. Challenging Bond's flashy exploits are the fictional spies created by British authors John le Carré and Len Deighton. These writers stress the moral conflicts inherent in espionage and geopolitical conflict, particularly during the Cold War. For instance, in le Carré's The Spy Who Came in from the Cold (1963), the hero himself ultimately dies on the Berlin Wall, after infiltrating East German intelligence. Le Carré's The Tailor of Panama (1966) and Deighton's The Ipcress File (1962) concern internal corruption of the intelligence service; their spies face crimes from both inside and outside their governments and bureaucracies. British dominance in espionage literature waned somewhat during the last quarter of the twentieth century. Since the 1980s, American novelists including Robert Ludlow and Tom Clancy have rivaled their British counterparts in writing best-selling spy fiction. Clancy's hero Jack Ryan foils Cold War plots in novels including The Hunt for Red October (1984) and Patriot Games (1987), from a progovernment, relatively conservative vantage point. These stories have become popular films, with their emphasis on technology and gadgetry translating easily to the visual medium. A somewhat ambivalent treatment of the security services, such as those offered by the nuanced works of le Carré and Deighton, perhaps anticipates the future of the literature of intelligence. The world of international politics is no longer viewed as Western-centric or bipolar (divided into adversarial nation states) as it was throughout much of the twentieth century. As international secret services turn to current crises like drug trafficking and bioterrorism, the shrinking world stage will likely be reflected on the pages of the literature of intelligence in the coming generations. Cawalti, John G., and Bruse A. Rosenberg. The Spy Story. Chicago: University of Chicago Press, 1987. Panek, LeRoy L. The Special Branch: The British Spy Novel, 1890–1980. Bowling Green, Ohio: Bowling Green University Popular Press, 1981. Smith, Myron J., Jr., and Terry White. Cloak and Dagger Fiction: An Annotated Guide to Spy Thrillers, 3rd ed. New York: Greenwood Press, 1995. Winks, Robin W. (ed. and introd. ); Maureen Corrigan (ed.) The Literature of Crime, Detection, and Espionage, I–II. New York: Charles Scribners, 1998. Price, Thomas J. "Spy Stories: Espionage and the Public in the Twentieth Century." Journal of Popular Culture no. 30 (1996): 81–89.